Pueblo pottery continues a centuries-old tradition. Over time, styles have changed, but production techniques have stayed the same. Hand coiled and stone burnished pottery is still a part of vibrant contemporary Pueblo culture. In the 1500s people from Bandelier moved to pueblos along the Rio Grande. Their descendants continue to live in pueblos within 80 miles from Bandelier National Monument. Pueblo crafts were in decline early in the 1900s. They were revived when tourists and artists came by railroad to see the ancient cliff dwellings, and Southwestern vistas and villages. Traditionally, women and girls made pots using skills passed from generation to generation. The very fine work of Maria Martinez, Pablita Velarde and other artists created an increased demand for Pueblo arts and crafts. 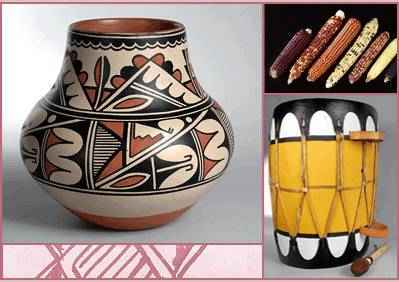 Contemporary Pueblo pottery is thriving in the Southwest. Maria Martinez [1887- 1980] of San Ildefonso Pueblo was an established potter when she married Julian Martinez. Her work was exhibited at the 1904 St. Louis World's Fair. Julian worked on site for Dr. Edgar Lee Hewett, director of the Museum of New Mexico. He was excavating in Frijoles Canyon in what is now Bandelier National Monument. In 1908, Dr. Hewett asked Maria to reproduce the ancestral Pueblo pottery he had found. That winter, Maria and Julian began making pottery for Dr. Hewett. Maria made the pots and Julian decorated and fired them. Together they introduced a distinctive highly-polished matte-on-black decoration for their vessels. They produced the blackware pottery by smothering the fire that reduced oxygen during the firing. Hewett liked the results so much that he helped them sell their work outside of the pueblo. It was the beginning of a new economic opportunity for many Pueblo craftspeople. The blackware became their trademark, and that of their extended family and other San Ildefonso and Santa Clara Pueblo potters. After Julian died in 1943, Santana, wife of their son Adam, did the decorating. Later a younger son, Popovi Da, took over decorating and firing. He became a highly-regarded potter in his own right. Many of Maria and Julian's descendants are respected potters today.